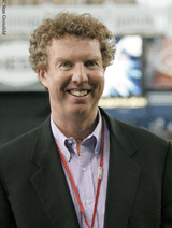 Dan Shaughnessy is an award-winning columnist for the <em>Boston Globe</em> and the author of several sports books, including “Fenway: A Biography in Words and Pictures”, “Spring Training : Baseball’s Early Season”, “Seeing Red: The Red Auerbach Story”, “Reversing the Curse”. He also wrote the popular classic, “The Curse of the Bambino”, a best-selling book now in its twenty-first printing. Seven times, Shaughnessy has been voted one of America’s Top Ten sports columnists by the Associated Press Sports Editors, as well as named Massachusetts Sportswriter of the Year. Dan discusses the media’s response to the Babe. Dan shares his thoughts on the Babe and his legend. Dan talks about some of his favorite baseball players. Dan talks about his childhood baseball memories.